Alastair Reynolds’ short novel SLOW BULLETS – the latest in a series of short novels from Tachyon Publications, following among others Nancy Kress’s Yesterday’s Kin and Daryl Gregory’s We Are All Completely Fine, both awards winners – is a spectacular far future space opera whose main defect is that it’s too short, and a bit skimpy near the end. 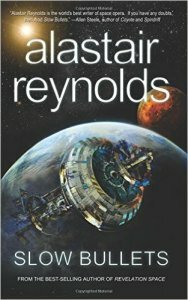 Reynolds is one of those authors whose works I’ve admired, those I’ve read, but whom I’ve been unable to keep up on over the years, partly because most of his novels are quite long, and mainly because of my own erratic attention over the past decade. I particularly admired House of Suns (2008, Wikipedia), a spectacular saga of competing multi-generational families that hold reuinions, via clones, every circuit of the galaxy or so; he makes the drama work within the constraints of non-FTL travel in a way I’ve not seen any other hard SF author do. SLOW BULLETS is also set in some remote, intergalactic future, as a long-term war between the Central worlds and the Peripheral worlds is winding down, has reached a truce. News of the truce is slow to spread, and so the opening of the novel involves Scur, a warrior on one side, being captured by Orwin, a sadistic warrior on the other side who hasn’t heard about the truce, who injects her with a second ‘slow bullet’, in additional to the one she already has; a memory device all warriors carry, to preserve their memories, but which application causes excruiciating pain. Scur awakes in a ‘hibo’ capsule aboard a prisoner starship with no recollection how she got there. Aboard are hundreds of other ‘prisoners’ from both sides of the conflict, along with a few crew members who seem to have no idea of what has happened – how the ship has apparently traveled for longer than intended, and how they do not know where they are. And so the story evokes, on a couple counts, a basic SF theme – the resetting of humanity without memory of a past, first on the starship, cut off from everything they’ve known, forced to rebuild some kind of internal society on their own terms; and second, with the gradual realization about where they’ve arrived, and what’s happened to the rest of humanity across its worlds, with an example of an SF encounter with an inexplicable alien ‘other’. The titular notion of the ‘slow bullets’ becomes crucial, as a threat to the loss of cultural knowledge, via decay of their starship, is resolved through self-sacrifice. Be honest with yourself, as one solder to another. We both know what hate feels like. It hasn’t gone away just because we spent a little time in hibo. It’s like a light filling you up from inside. It’s leaking through your skin. A fine short novel, and one which invites attention to his longer works. This entry was posted in science fiction, Species Reset. Bookmark the permalink.